Very friendly and helpful staff. Apartment very clean. Pool cleaned daily and surrounding area clean. Hotel services was great! Staffs were very nice and helpful. Everything was amazing at the Grapevine. Our holiday was made extra special due to how relaxing our surrounding where and the hosts made you feel really special. Looking to return next year. Superb location, very friendly host and staff, lovely hotel and facilities. Thoroughly enjoyable stay. Hope to return again sometime. Perfect for us. Close to everything but still nice and quiet to come back too. Superb week. Hotel is excellent can’t fault it. Hope to go back one day but it’s a big world. Andi and her staff are always so welcoming, extremely pleasant and go out of their way to make your holiday perfect. Stayed here twice and already booked for next year. Lock in a great price for Grapevines Hotel – rated 9 by recent guests! Within lush grounds, the family-run Grapevines Hotel is located in Alikanas, only 650 feet from Alykes Beach. 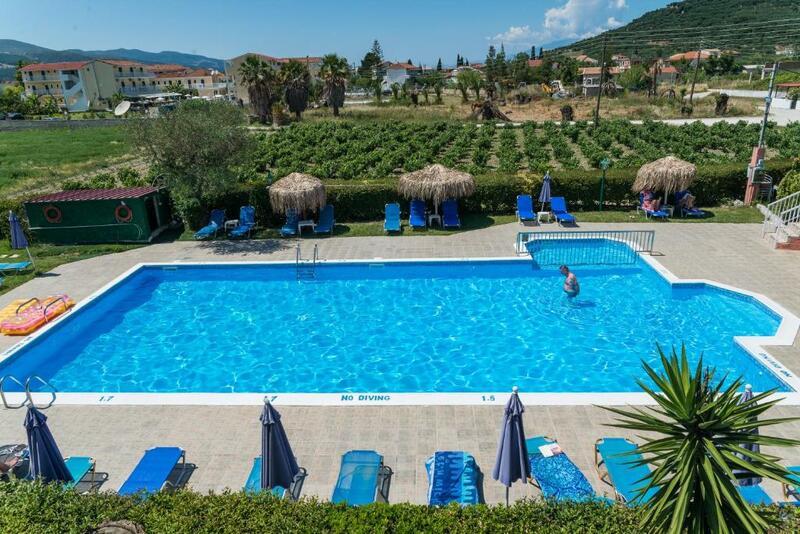 It offers an outdoor pool with furnished terrace and a pool for children. The air conditioned rooms open to balconies overlooking the pool and lush surroundings. Each can accommodate 2 to 3 people, and includes a TV and a kitchenette with teakettle and fridge. Snacks and refreshments can be enjoyed on the poolside. An air conditioned lounge with TV is also available. Relaxing seating areas and BBQ facilities are featured in the hotel grounds. Zakynthos Town is 9 miles from the Grapevines. The island’s international airport is 10 miles away. The hotel also offers free private parking. This property is also rated for the best value in Alikanas! Guests are getting more for their money when compared to other properties in this city. When would you like to stay at Grapevines Hotel? Please note that extra beds can be accommodated in this room type upon charge. This family room has a dining area, seating area and electric kettle. House Rules Grapevines Hotel takes special requests – add in the next step! One child under 12 years is charged EUR 7 per person per night in an extra bed. Grapevines Hotel accepts these cards and reserves the right to temporarily hold an amount prior to arrival. Shower curtain needed to be a bit longer. The room was a bit smaller than I expected. There is no WiFi, very bad! Nearby hotel’s noisy pump (broken? ), occasional noise from other guests. The owner (Andy) is very friendly and works her socks off to make your stay a good one, helped by her sons. 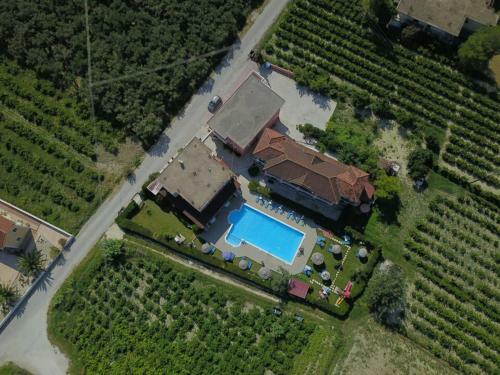 Quiet location amongst farmers fields you have several options for your evenings (onsite, main strip or the beach front). All walking distance. Great large clean pool. Good food options. Just returned from our second stay at Grapevines. Small family run hotel. 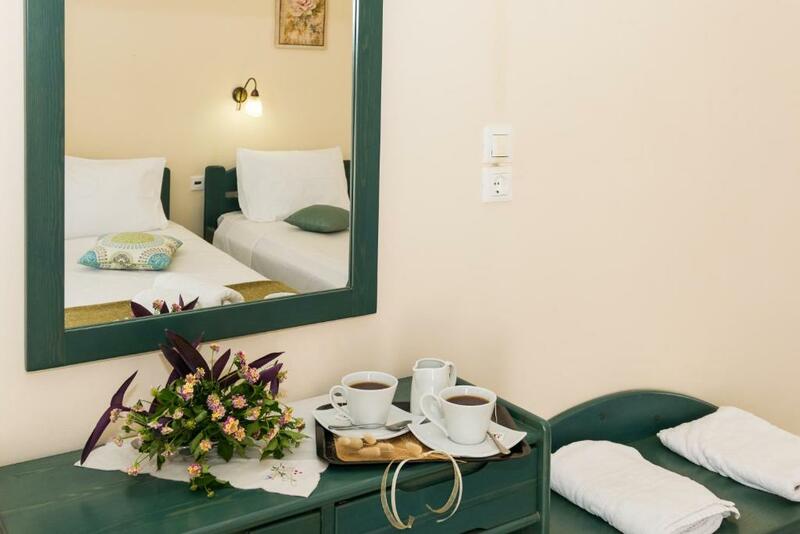 The accommodation is basic - usual Greek rooms. Very clean and tidy, regular towel and bed changes,daily bin change. Rural location, very peaceful, yet it is still close to everything. Andi is an excellent host.